See the Chinese Theater, Disney Concert Hall, Hollywood sign, and more! Explore Newport, Huntington, and Laguna Beach! Experience Universal Studios and Magic Mountain! Private Tours Create your own tour of LA & Hollywood! Being a family owned business in Anaheim, we are committed to providing the very best to our clients. Our reputation depends on you, sharing your experience with others! We hope that you’ll feel like family when you take an Anaheim tour with us! 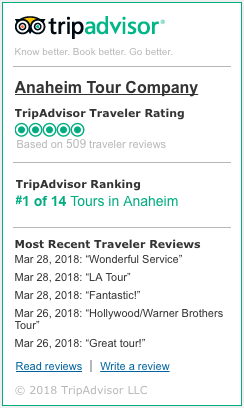 Enjoy the best that Anaheim, Los Angeles, Hollywood, Orange County, San Diego, and surrounding areas have to offer, without the high costs or inferior service. Compare for yourself and read our TripAdvisor reviews below! So book your Los Angeles and Hollywood sightseeing tour NOW and see what you can see, with us! Personalize your tour to match your needs!